The earliest known use of the American phrase, “The Whole Nine Yards,” an expression meaning “all of it, the full measure,” dates back to 1907 in Southern Indiana, but for one new Statesboro seafood restaurant, the term is a business model by which everything from the food to the service is based around. 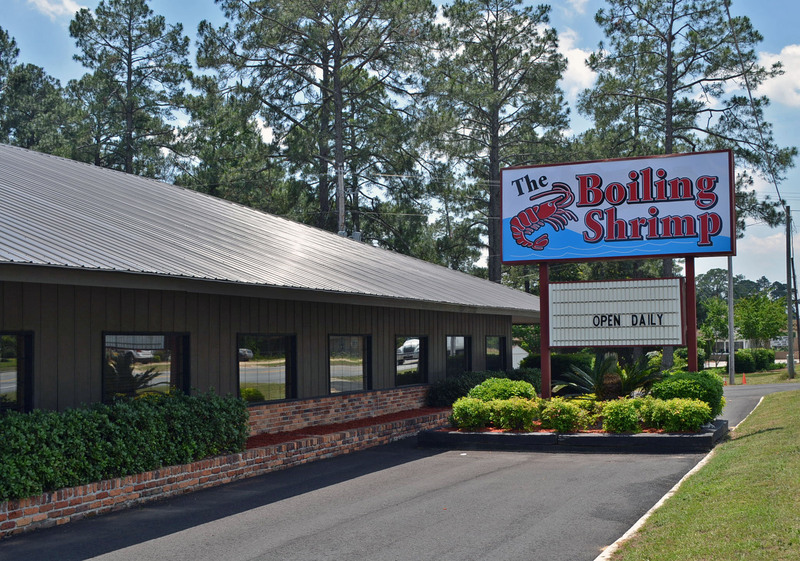 The Boiling Shrimp opened just over three months ago on U.S. 301 South with a mission to make seafood work in Statesboro punctuated by an unconventional, Asian-influenced approach. After visiting for dinner recently, I caught up with Assistant Manager Adam Tsang to get the details on this restaurant’s unique spin on presentation, flavor and entertainment. 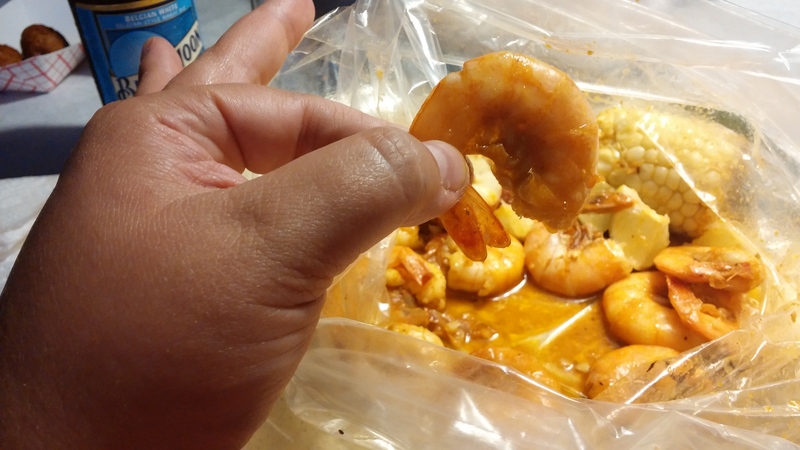 Two things that caught my attention immediately: 1) Customers place their order in a 3-step sequence and 2) Food ordered Low Country boil style, is presented in a clear, plastic bag. First, you choose your catch, next your flavor and lastly, determine how you’d like it prepared. “We found that if we served the food directly on the plate, the sauces and seasonings don’t stay on as well,” said Adam. On my visit, I ordered a 1/2 pound of boiled shrimp with Cajun sauce for $8 and washed it all down with a cold Blue Moon. Currently, the restaurant serves beer with future plans to offer wine. Once I got over the shock factor of the plastic bag on my plate, I found its contents divine. 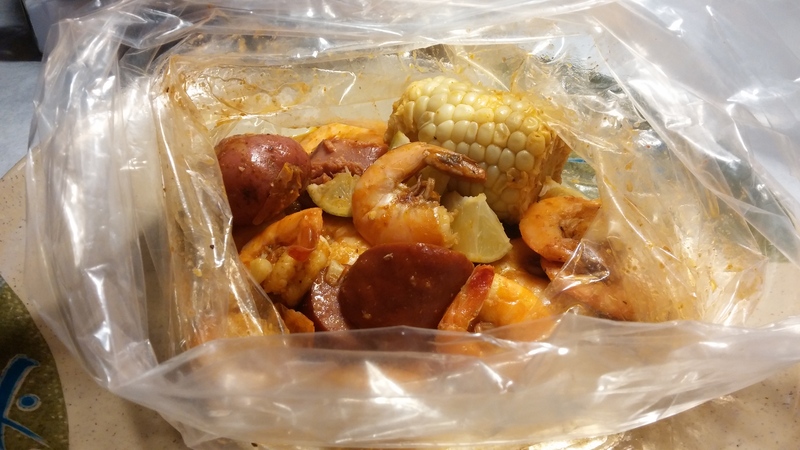 The aroma of a Low Country boil hit me as soon as I untied the bag, and the size of the plump, succulent shrimp alongside a half ear of deliciously seasoned corn on the cob and juicy sausage was all I needed to feel right in my element. Fresh, good quality seafood in the coastal plains of Georgia? What more could one want? Deep Fried Hush Puppies are $2.50 an order. Crunchy and fitting. I ordered a house salad with my meal. Nothing fancy here, but satisfying. Slow-cooked Gumbo is $6 per bowl. Menu items also include soups, salads and po’ boy sandwiches. Adam says the Fried Shrimp Basket is one of their most popular dishes. So, just where does the Asian influence come in to play? Owned by longtime Statesboro residents Charles and Jean Hsu, the Taiwanese Americans created their sauces –your choice of chili pepper, lemon pepper, Cajun or garlic — based on influences from their travels and previous restaurant experiences. “The Whole Nine Yards” is both a sauce (a combination of all of the above) and a dish on the menu. Asian influences can be found in the tempura fry style and preparation of the batter. Coastal decor fills the dining room. The entry way includes a bar top and waiting area. Convenient hand washing stations are located outside of the restrooms. Seafood restaurants in Statesboro don’t have the best track record. Carry Hilliard’s Restaurant closed after just two years and The Shell House, what is now The Mill House, didn’t survive the college town either. Adam says, at The Boiling Shrimp, they’ve learned from the mistakes restaurants who’ve gone before them have made. With more than 700 Facebook “Likes” and a lot of positive buzz surrounding them, they’re off to a great start. If you haven’t made your way over to see them yet, keep an open mind and give them a shot! If it’s good seafood you seek, you’ve come to the right place. Thanks for stopping by! If you like this post, you may also be interested to read about a few of the other local restaurants and bakeries I’ve reviewed. As the Statesboro Herald food columnist and a Georgia Southern University alumna, the ‘Boro is a second home to me. Be sure to like Some Kinda Good on Facebook, or follow me on Twitter to keep up with all my latest, local food discoveries. Next Some Kinda Good Teams Up with Paula Deen LIVE!